After Pizza, Karthik Subbaraj is working on his second film called Jigarthanda with Siddharth and Lakshmi Menon as the lead pair. The teaser of the film was released recently and the ‘cold’ness of the frames attracted the audience big time. A shot in which Siddharth facing the camera, on his knees with hands tied behind, with the meaning of the title and its relation to the frame had sent in a ‘chill’ wave to the viewer. Now as per the director, the teaser has already crossed three lakhs views in just three days on YouTube and the team is all set to release the poster of the film tomorrow, the 12th February 2014. 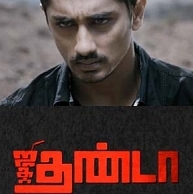 Since Karthik Subbaraj has earned himself a reputation of a director who innovates, the expectations for Jigarthanda are pretty high. People looking for online information on Jigarthanda, Jigarthanda Teaser, Lakshmi menon, Siddharth will find this news story useful.